It is with our deepest sorrow that we say goodbye to our beautiful Mom, Grandma, Nana and G.G. In 1947 at age of 18, Betty left her homeland, England to marry her Canadian soldier Earl Jensen. They were married for over 50 years until Earl died in 1999. 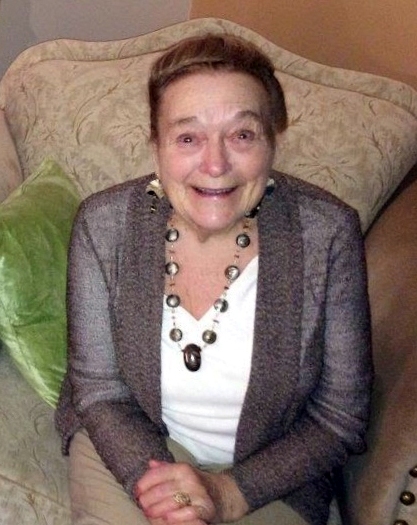 Betty is survived by her daughter Carolyn Schaff, husband Rick and son Bob Jensen, wife Jenny, four grandchildren, five great grandchildren and her brother John. Betty was an inspiration to all who knew her. She told stories of traveling the world, first with her husband Earl and later with her brother John. She continued to write letters to many of the people she met on her travels. While riding her bike on the dykes of Port Coquitlam or the river in Maple Ridge, Betty made many friends along the way. She was so very proud of her lovely home and stunning flowers. A show piece for all to see. It is too soon for us to lose such a wonderful role model for our family. We are happy that she is out of pain. Perhaps she is now dancing with the love of her life, Earl! We love you so very much and we will miss you with all our hearts. A celebration of life will be held at Meadow Gardens Golf Club.